The infestation begins, rapidly overtaking medical resources and resisting all treatment. One woman knows the danger, Carla Nero, chief scientist of the Centre for Disease Control. 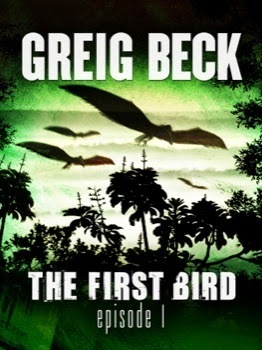 She makes Matt an offer he can’t refuse and together they join a team heading to the deep jungle in a desperate race to locate the hidden place where the specimen was taken. Only by finding the location of the specimen can the team and the world hope to uncover the secret of how to survive the ancient, horrifying parasite that has been released. I read all three episodes of The First Bird one right after the other because I felt it was one story in three pieces and planned to write a single review. As I read, I found the episodes so logically divvied up the plot it only made sense to write three reviews. I liked the characters were not stereotyped, per se, but sufficiently relatable as types I'd seen before I was able to fill in the blanks and build them up in my minds. It made it easy to be attached to them and also just as easy to feel okay about being angry with them or cringe when they did something I thought wasn't thought through. I also really like the whole virus==doomsday scenario and appreciated this one was not the result of a mad scientist or supernatural event. It makes it even creepier when a plague in a remote area spreads and all the more plausible. Matt Kearns is a great main character. I appreciate a hero who doesn't always do or say the right thing yet figures things out in time to come out okay. I will definitely get in to Beck's Alex Hunter novels. This episode combines icky illness, great character introductions and diverse settings into an engaging start for the series. If you're picking it up, I recommend going right for the Omnibus. I expect once you start you'll be in for the finish.